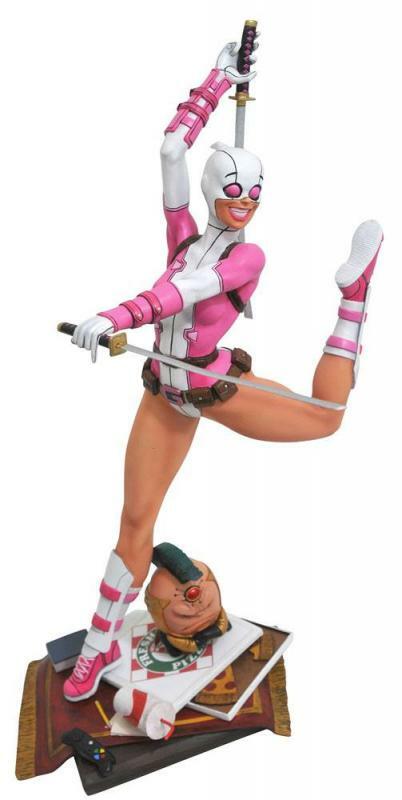 Soška Gwenpool vytvořená podle předlohy figurální řady the Marvel Premier Collection vycházející z tvorby Clayburn Moore je vysoká cca 35 cm s detailním zpracováním. The Merc with a Smirk leaps into the Marvel Premier Collection with this dynamic sculpture! The death artist formerly known as Gwen Poole wields twin katanas as she lands a jetée amid pizza boxes and tiny MODOKs in this limited edition 12-inch scale statue. With only 3,000 pieces made, the statue comes packaged with a certificate of authenticity in a full color box. Hand-sculpted by Clayburn Moore!